To start this thing off, I should mention that I’ll have a co-host for this art-centric Rapid-Fire. Ladies and gentlemen, I give you Art Student Owl. (Fair warning, non-family friendly language in them thar internets.) Art Student Owl will be introducing all my topics this week with his meme-based anecdotes, so let’s get this thing going! Okay, full disclosure. Own Tempo isn’t exactly an art-based Ability, but it does relate to an art-themed Pokémon. Okay, the art-themed Pokémon. Amongst others, Smeargle is a user of Own Tempo. Of the other sixteen pokémon with Own Tempo are included Spinda, Slowbro and Slowking, Ludicolo, and Lickilicky. The effect of this Ability is to grant the user an immunity to confusion, even if it would be self-inflicted with a move like Outrage. Own Tempo can also be Skill Swapped or Traced, immediately curing the user of a pre-existing confusion condition! Apparently, art-related Abilities all have to do with preventing things, because Insomnia is the next item on the docket for today. As the name suggests, Insomnia prevents your pokémon from falling asleep. This has the potential to be a bit of a double-edged sword, because while you’re prevented from falling prey to Dream Eater or Nightmare, you’re also unable to take advantage of Rest. That probably won’t come up too much, because with the likes of Honchkrow, Ariados and Hypno on the insomniac list, you won’t be doing too much walling or stalling. I’d be remiss to not also mention that Banette has access to Insomnia, and as a Ghost-type, would normally have quite a bit to fear from a move like Dream Eater. Just food for thought. Sorry, this is a artist-themed article. Ramen noodles for thought. This sucker is the signature Ability of the chameleon pokémon Kecleon. The little lizard doesn’t quite have the stats to hold its own in a competitive battle, but its Ability’s gimmick sure is fun! Kecleon’s Color Change works like a sort of type-camouflage, and it could be used to force an opponent with too monochromatic a move pool on their pokémon to play a big switching game. When Kecleon takes damage from any attack, its type will change to match the element of that attack. This particularly plays into Kecleon’s favor when battling a pokémon with a lot similarly typed of Special Attacks, as its Special Defense is its best stat. Well folks, that about does it! Unless you have anything to add, Art Student Ow- …WHAT? 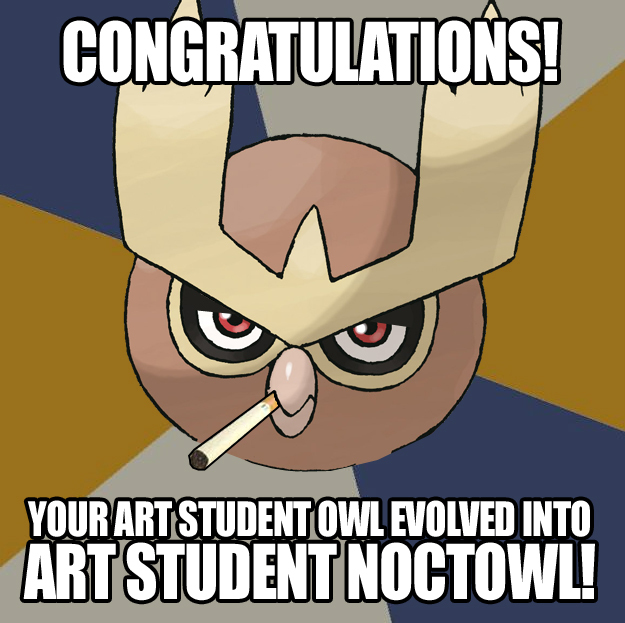 Art Student Owl is evolving! Oh GOD. What hath science wrought! ?